Michael A. Burstein (via io9) highlights an interesting point when it comes to genre fiction in a post that looks at the politics of a writer and looking to the point where a reader is alienated. It's an interesting read, and I recommend checking out both his review, and the other review that he's referencing. The question arose though, that wasn't really addressed on a larger picture: When has science fiction been free from politics? The very nature of the genre is one that can lend itself to political elements, on both the right and left sides of the house. Science Fiction is about the changing nature of humanity and people's work to understand the world around them, either in the future, past or present, but most of all, science fiction is influenced by the culture that helps to shepherd its creation. Looking over a couple of books that I've read and am somewhat more familiar with, there's a good selection of books that cover any number of larger political issues, either explicitly, or referentially. The story in question in the original review is Fossil Figures, by Joyce Carol Oats in the anthology Stories, where a pair of brothers are made distinct: one is labeled a Demon Brother, and through the course of the story, it's fairly clear that he's a conservative politician, and by extension, it can be interpreted that Oats is deliberately labeling the Republican party as one of demons. (At times, I can't say that I disagree) Clearly, there is a political statement to be made here, and I felt that the distinction didn't feel out of place, but helped set the story in a modern, relatable setting that the reader will identify. This tends to fall along one of the more explicit references to modern politics, but other stories that have come out recently delve into some other hot-topic issues. Karen Traviss's Wess'Har Wars deals heavily into environmental policy, from the first book, City of Pearl, where her main character, Shan Frankland, is set off on a mission to Cavanagh's Star, several hundred light years away, to locate a missing colony. As the story transpires, a weighty, pro-environmental message comes out, as Frankland comes across the Wess'har, an alien race that has very set opinions and beliefs on the sanctity of nature, and have gone through great lengths to protect Cavanagh's Star, to the point where they are willing to destroy entire races and species. This ties in closely with the futuristic world, and it is possibly one of the earlier books to be influenced on the modern attitudes of global climate change. Another author, Paolo Bacigalupi, has penned two novels (The often mentioned The Windup Girl and Ship Breaker), both of which deal with a closer time of climate change, and the influences that is has upon human society: there are major consequences. In Traviss's take, these consequences take the form of an alien race that's very dedicated towards rolling back some of humanity's mistakes with the climate: at our expense. Bacigalupi paints a very bleak picture of humanity as a sort of post-human individual, where people have adapted to literally eat rocks in The People of Sand and Slag. Global Climate change is a major political issue at the moment, and I personally believe that this is the next major movement when it comes to science fiction themes and content, much as the Cold War between the United States and the Soviet Union sparked its own set of science fiction influences. Politically, Climate Change is one major issue, especially as its full effects aren't going to be instantaneous, but played out over a larger stretch of time. The future elements and implications associated with this have sparked the political world as people begin to think about how to plan ahead: the impacts on business and society are immense, and clearly, this is good trawling grounds for the near future. At the same time, a large number of people still harbor doubts about the concept, and in Bacigalupi's works, there's clearly a political message that will turn some people off, if a couple of the lower amazon.com ratings are anything to go by. Going back a couple more years, a read through Philip Pullman's fantastic novel The Amber Spyglass, which took the story that had been set up by the two prior books in the series, and dropped an extremely thoughtful and controversial story within that addressed the nature of the fall of mankind and original sin. This largely anti-established religion story had been building throughout the His Dark Materials Trilogy since it the first book, but The Amber Spyglass was the fulfillment of most of those thoughts. Around the same time, J.K. Rowling's Harry Potter series was aggressively attacked by people who fervently believed that the story was aimed towards converting children towards the occult, something I've always been puzzled by, especially with the release of Pullman's series, which could do a lot more serious damage to the Church itself with some of the ideas that were within it. Pullman's recent book, The Good Man Jesus and the Scoundrel Christ, where Pullman himself noted that there was a deliberate attempt to rouse people in the name of free speech. (His comments are here.) The American political right and the much of the religious community seem to work very well together, and when it comes to fiction, religious is likewise ripe for speculative fiction, given the similarities between searching for meaning and context in one's life, or in the future. Pullman's words have certainly put off readers, given the content, but at the same time, there's quite a story behind those words, which readers would do well to think about. One of the most notable examples of science fiction and politics merging is through Robert Heinlein, and his numerous books. Two of my favorites are Starship Troopers and The Moon is a Harsh Mistress, both of which touch upon libertarian and the overall relationship towards government. 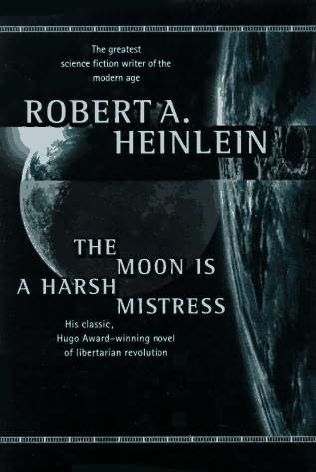 The Moon is a Harsh Mistress struck me as being far more libertarian when I read it years ago (it's currently awaiting a re-read), with echoes of the American revolution within it, as the colonists on the moon sought to free themselves from a distant government, while Starship Troopers is notable for its anti-communist feelings, but also the responsibilities of people to be active in their society, contributing towards the good of the whole, rather than a government enforcing such values from the top down. These books came at a time when science fiction was heavily influenced by surrounding cultural occurrences, from the possibility of war to competing political ideologies. The political elements of science fiction are generally shaped by the culture around it. I'll go back to the argument that I've generally made before, that art is created within a certain context, and that people will gain different appreciations for things at different points in time. Politics represent a major opportunity for authors because of the variety of underlying philosophies and outlooks that they tend to promote: conservative values look towards a smaller, less intrusive government, while liberal politics look to a more well structured and powerful central government, and the conflict between these two viewpoints has existed for as long as the country has been around. Doubtlessly, it will continue to rage on in the pages of science fiction novels as well.